With Sagilo task management will be a walk in the park. You can easily plan your deliverables, create and assign tasks to your team, collaborate and track progress. Sagilo not only helps you to foresee any delays but also allows your team members to collaborate amongst themselves. Register for a free account to find out how. Every team member can comment on each task activity; thus encouraging a healthy disussion between team members on every tasks and issues. Every action on every task is captured. Whether a comment is posted by a team member or status of a task is changed; you can any time get the history of activities performed on any task. Get notified via email every time an action is done by any of your team members. Email alerts help you get updates for your tasks and projects in real time. Whether you are working from office or from the comfort of your home; you can anytime anywhere manage your project. 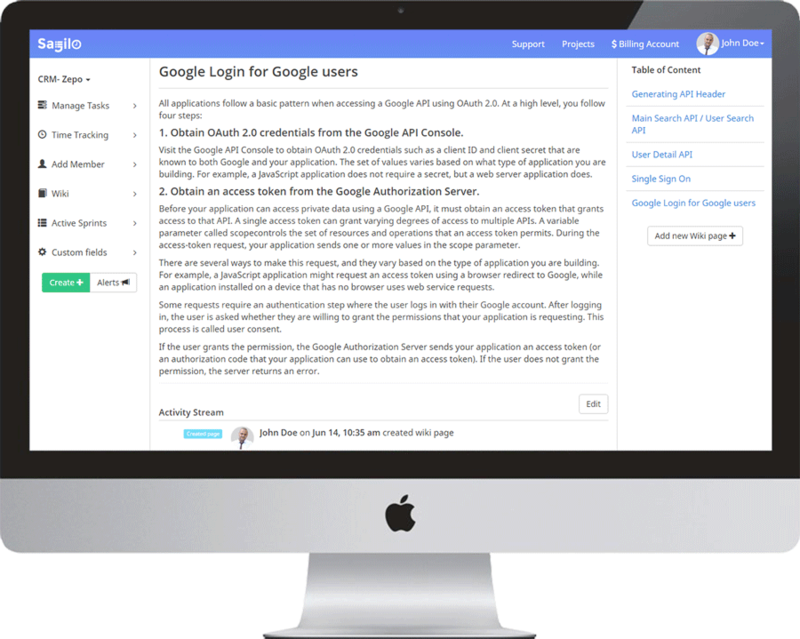 Sagilo is a web based task management software hosted on cloud servers. Do you charge your clients on per hour basis? 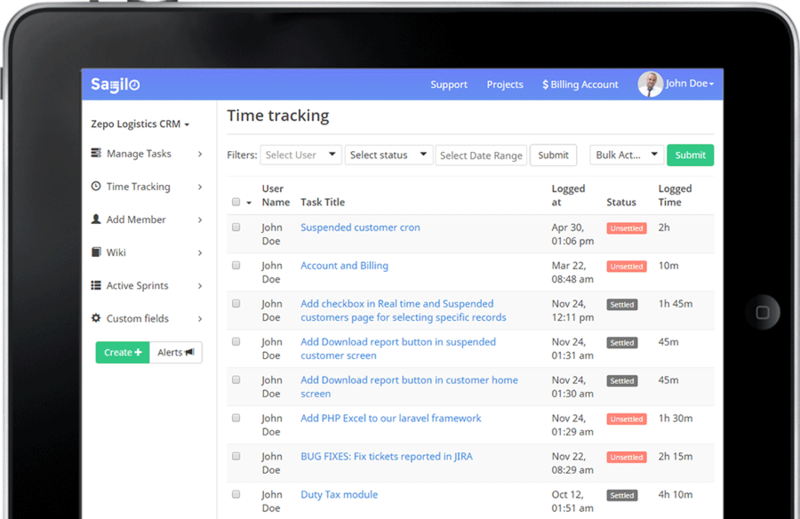 If yes then you would love how Sagilo helps you track time logged by your developers. Every team member is able to log hours against the task he worked for. Estimate you tasks. And based on hours logged and task status easily predict if your team is going to make it on time. This helps you take appropriate action before the D-day arrives. Still creating documentation files in Word and mails? Well, with our powerful Wiki with WYSIWYG editor you can easily create documents online. Creating docs in our Wiki will allow every team member to get access to it anytime anywhere. Not just writing docs but Sagilo allows you to upload your files over our cloud servers. Be it a zip of your codebase or a screen shot of your desktop screen; easily link files to Wiki pages and tasks. 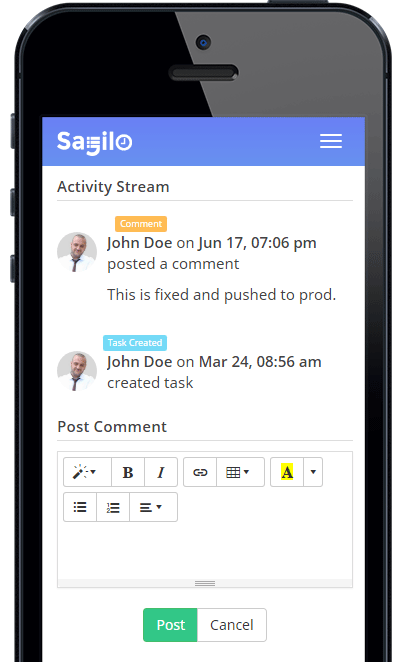 Sagilo is a complete task management software with support for Agile sprints and Kanban views. Sagilo lets you create Epics, Stories and Tasks. Break up your project into small deliverable sprints and track progress on each sprint. With estimates, logged hours and intuitive charts track progress of your project with ease. Unlike other task management softwares we are not talking about any free trials but a life long unlimited plan. Basic plan of Sagilo is free of cost. With free plan you can create upto 3 projects with 3 users. And this should be more than enough to get you started with Sagilo. Note that apart from number of users and projects there are no other limits on the free plan. Register for this task management software free of cost right now.